Ideological warfare, threatening the very future of Western civilization, is being waged on university campuses across America and around the world. The Israeli-Palestinian conflict has led to student demonstrations and activism by pro-Palestinian groups fueled by hatred for Israel and Jews. The university should be a place of open discussion and an exchange of ideas, not a forum for hatred and intimidation. Christian voices cannot be silent in the light of rising anti-Semitism. Our declaration is that the sin of silence the Church committed in 1930's Europe will not be repeated. We must find ways to empower leading Christian students to be a voice on their campuses. Too often, American Christian support has been vague and un-empowered because most Americans are not familiar enough with the history and complexities of the situation facing Israel today to feel confident as they speak. American Jewry has deeply and intentionally educated its population, and ensured their long-term support and connection to the Land through various programs such as the Taglit (Birthright) program. 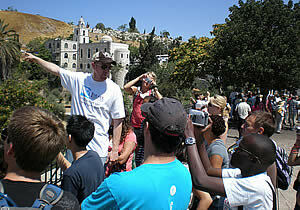 This program allows Jewish young people to experience Israel and the reality of the current situation in the Land. As important as this is, there also exists an extraordinary need for non-Jewish pro-Israel youth to grow in their knowledge concerning the Land of Israel. Through the Israel Experience, the best and brightest Christian young people will be equipped to confidently serve as educated ambassadors on their campuses and in every aspect of their lives, both now and in the future. This will not simply be a tour or summer field trip, but an intensive time of education and relationship building that will increase support for Israel. In the midst of the raging culture war and the attack on Judeo-Christian values, the Israel Experience is giving tomorrow's leaders an educated heart for Israel.